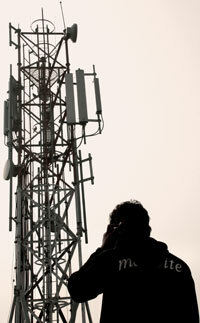 Telecom service providers’ study shows mobile phone towers are safe. But are they? “LET the headlines be that mobile towers are safe,” declared Rajan Mathews, director of the Cellular Operators Association of India (COAI). He said this while presenting the findings of a survey commissioned by cell phone service providers to measure radiation from mobile phone towers in Delhi. The survey conducted at 180 spots in the Capital found radiation levels from the towers extremely low. These findings were meant to counter an earlier survey by a media house and a private company, Cogent EMR Solutions that provides radiation safety solutions. It reported high levels of radiation from mobile phone towers last June and led to an increase in court cases by residents associations worried by radiation risks from the city’s mobile phone towers (numbering about 6,000). COAI and its ally, the Association of United Telecom Service Providers (AUSPI), commissioned reputed institutions— IIT Madras, Thiagarajar College of Engineering in Madurai and Centre of Excellence in Wireless Technology at Chennai—to carry out the survey. Cell phone towers in India operate between radio frequencies of 400 MHz and 2,000 MHz. The researchers measured the frequency and power field of a particular spot to calculate the electrical and magnetic fields; they included both GSM and CDMA wavelengths. At the lowest level, electric and magnetic fields measured 4.3 million times below the standards prescribed by the International Commission of Non-ionising Radiation Protection (ICNIRP) guidelines. The highest level measured was also low—68 times below the ICNIRP standard of 9,200 milliWatt per square metre (mW/sqm). COAI and AUSPI, during the media conference, had shown a video clip of the survey which showed persons taking measurements with instruments shielded by a technician on one side and a car on the other. The objects or persons acting as shields would have absorbed part of the radiation, Kumar said. Zafar Haq, former chief executive officer of Cogent, defended his company’s findings. “Radiation levels do not remain static. High fluctuations happen due to traffic movement and usage patterns. It is less prudent to compare or claim any two readings contradicting if they are not taken at the same time, location and under same conditions,” he said. EMBRYOS AT RISK: Pregnant women may need to reduce their use of mobile phones. Exposure during the first three months of pregnancy retarded growth of embryo. Other factors such as watching the television also added risk. BRAIN TUMOUR: In Japan, 787 persons suffering from acoustic neuroma (type of brain tumour) were questioned about the years of mobile phone use before the date of diagnosis. Risk increased with longer periods of use— both in terms of years of use and time of use per day. NO CHILD’S TOY: Parents should think twice before handing cell phones to their children. Adolescents were observed for an year. It was seen that those with increase in voice calls and SMS showed reduced response during various computerised tasks. MEMORY LAPSE: Electromagnetic radiation affected the consolidation phase of recognition memory process in mice. Researchers put this down to the radiation targeting the information transfer pathway connecting median temporal lobe and hippocampus. Pathophysiology, November 2010 SHORT LIFE: Chronic exposure to a low-intensity GSM-like signal on health and survival of female Sprague-Dawley rats showed life-long exposures reduced life span significantly. The new survey has some discrepancies, too. For instance, the electric field at the Nehru Place footbridge in south Delhi which has a number of towers operating at 21 different radio frequencies measured 0.00026477 volts/meter; but the reading near Chelm-sford Club in central Delhi where there are fewer mobile phone towers, operating at six frequencies, was higher—0.0002996917 volts/metre. India has not evolved country-specific standards for radiation from mobile phone towers—the Department of Telecommunication has adopted the ICNIRP guidelines. “But we have chosen the worst aspect of the standards,” said Kumar. Instead of adopting cumulative standards for a range of frequencies, India has the same standards for all service providers. This results in people getting exposed to higher levels of radiation, he said. Countries like Canada, China have more stringent radiation norms than ICNIRP standards. The studies on health effects of radiation from cell phone towers are few. But the ones that exist are indicative enough. One study published in the Biomedical Environmental Sciences in June 2010 looked at the effect of exposure to GSM mobile phone base station signals on salivary cortisol, released in response to stress, on the digestive enzyme alphaamylase, and on the antibody immunoglobulin A. They found a mix of high and low exposures led to increased alpha-amylase. There was also an increase in cortisol levels in persons exposed to even low radiation. The researchers concluded that radiation in considerably lower densities than the ICNIRP standard may influence stress markers. Researchers from the Australian National University Medical School who published their review of literature on the subject in the July-September, 2010 issue of the International Journal of Occupational and Environmental Health, indicate ICNIRP guidelines are inadequate. Eight of the 10 studies reviewed reported increased prevalence of adverse neurobehavioural symptoms or cancer in people living at distances less than 500 metres from base stations. None of the studies reported exposure above ICNIRP standard. The December 2010 issue of the journal, Bulletin of the World Health Organisation, too, has a review of literature on cell phone towers. Researchers concluded there is no association between any health outcome and exposure to radio frequency. But they caution “the absence of evidence should not necessarily be interpreted as evidence that no harm exists”. The researchers from Swiss Tropical and Public Health Institute and University of Basel in Switzerland suggested that other sources of radio frequency and electromagnetic fields like mobile and cordless phones and wireless local area networks should also be assessed. Of course, breaking traffic rules isn't the only reason for getting towed or availing the services of a towing company. times. In general, it will usually cost over $50000 for a heavy-duty, used tow truck.